Certain smells, sights and sounds can bring back memories. The smell of chocolate chip cookies baking reminds me of my mom and coming home from school, or the smell of certain colognes remind me of high school. Rain reminds me of nights in my room with the window open, soaking in the smell and sound and feeling peaceful. But over the past year, Shawn and I have noticed lots of similar triggers that bring back not so great memories. Some that literally send us into a panic. We will be watching a TV show and if there is beeping both of our hearts start to race as we worry that Beckett’s pump is going off only to realize that he doesn’t even have a picc line or feeding tube anymore. I instinctively want to pack a bag the night before we have clinic because seeing Clinic in my planner triggers memories of being admitted to the hospital every clinic visit for almost a year. And yet we haven’t been admitted to the hospital in over 9 months. And one of the most vivid ones for me is certain types of soap because the smell instantly transports me back to the hospital. It’s been an amazing year and we have only had minor bumps and bruises and I still kept wondering why I would have such hard days and painful memories. We were always able to push past but they were still there. I even struggled through this latest pregnancy. I tried not to think of the baby growing inside of me. It was a defense mechanism. I was trying to protect myself from getting hurt. But I digress. To really understand what I’ve been feeling, I need to back up. To almost 2.5 years ago…..
After we had Beckett, literally minutes after, when we were sitting in the hospital room holding our new little son, 2 months before we even knew he was sick, Shawn and I had a very strong impression. We started talking about baby number four. Now I had just given birth about 3-4 hours earlier so this was seriously crazy talk. But neither of us felt it was odd at all. We just knew that there was another baby for us. We talked about possible names and what gender we thought this other baby could be. Crazy right?!? Looking back, I truly believe that this was a tender mercy from my Heavenly Father. He could see our path and knew I would be terrified and so he gave me strong feelings to help me stay where he wanted me to be. I’m not sure if I would have tried for another baby after Becks if I hadn’t felt so strongly about it before he was diagnosed. Although there has never been any indication that his disease is genetic, it’s hard to not let your mind go there. 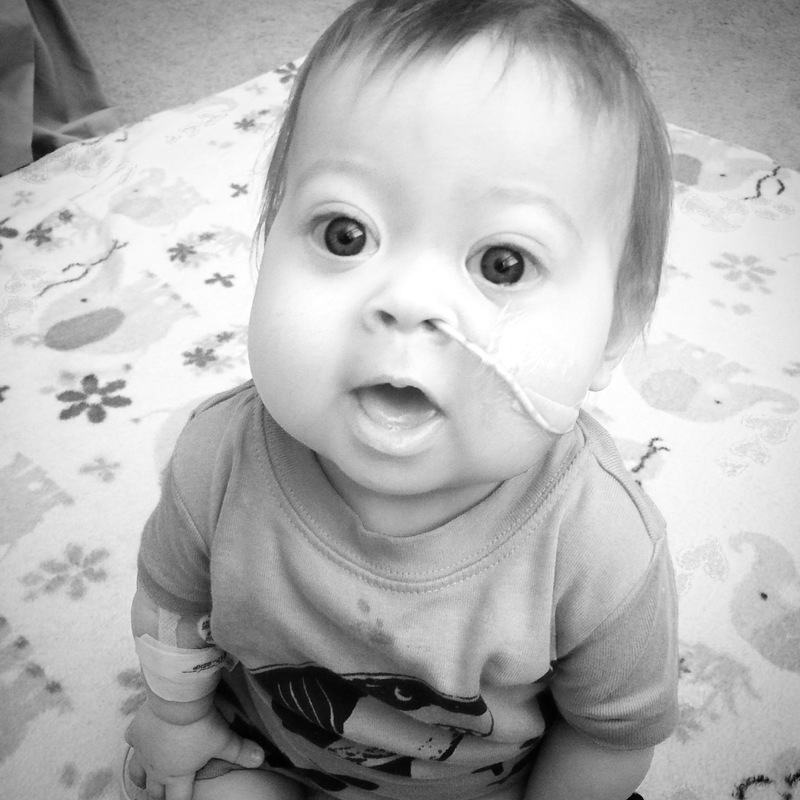 After we conceived, I worried and prayed about this baby. Then I did the opposite and just pretended that this whole situation wasn’t happening. I made myself busy and some days truly forgot that I was pregnant. I can’t get hurt if I don’t get attached. I did not want to again go through what we did with Becks. We found out we were having a girl and chose her name. Finley. But still when I prayed, I didn’t use her name. I didn’t want to get attached. Now I was still excited to be having a baby, I was just afraid and so I distanced myself from her. November 29th came and this beautiful little girl came rushing into the world. I was in labor for only 4 hours. After 2 hours of intense contractions, we headed to the hospital and I had her 2 hours later. I didn’t even push, she just came right out. It was the first time I didn’t get emotional when they handed her to me. I didn’t cry. I just felt shocked. No matter how much you pretend to not be pregnant or try to push it from your mind, once that baby is here, it’s REAL. I held her and looked at her. Then the nurse mentioned that she was having a bit of an issue breathing and that’s when it hit. The emotions came rolling out of me. I was crying, feeling such intense love for this little person. I kept asking if she was ok and they suggested skin to skin. After several hours of this, her breathing was much better. She never had to go to the nursery, and they never had to call anyone to come check her out. It’s now been a month since Finley was born and she is healing me. Bits of my soul and my sanity are piecing themselves back together and I’m feeling whole for the first time in a long time. I felt like I was robbed of so much of Beckett’s babyhood and Finley is showing me that it’s ok. It’s ok to love fiercely and deeply no matter what we’ve gone through. It’s ok to open yourself up to pain because you never know what will happen. I’ve been so afraid of getting hurt, I check Finn’s poop religiously to make sure it’s the right color and am constantly asking Shawn if she is looking jaundiced. But in opening up my heart to her, I am filled with so much love and joy. She is a light. She is peace. She reminds me of all the good in those around us. I’m learning to not freak out at every little sound that reminds me of the hospital. I’m letting myself forget. I’m letting love win. Wow. It’s been a long time since we have posted. Thankfully that is because life is beginning to feel normal, well a new normal. We are busy living life rather than worried at what life is going to throw at us. Post transplant life has been interesting for us. 1. We have had to come to terms with the differences in this life, physically. We have labs, doctor visits, and lots of med changes. But also 2. We have had to find our new roles in the world. I want to explain a bit about these changes we’ve been going through. Becks is doing awesome. His kidneys are bouncing back, his liver is HAPPY, and overall he is developing perfectly. But it has been a challenge. We have been doing weekly labs for 9 months. The poor kid is a pin cushion. He has handled it so well until he learned the word no. Now when he sees the needle, he says no and cries. It’s pretty heartbreaking. As you can imagine, it’s been interesting to fit labs into our weekly schedule. Some days Shawn just takes him, other times I do, but my favorite times are when we go as a whole family. We know all the lab techs and enjoy seeing them weekly. They all love Becks. We just got word that we can move his labs to monthly and it was such great news!! Along with our weekly labs, we’ve been going to our liver doctor monthly. It was weekly, then every other week and now we’re finally to monthly. It was hard to drive up to Salt Lake so often but now that it’s monthly, it’s so much easier. It’s fun to see the faces of the nurses and doctors, who worked so closely with us, as they see how much B is growing and changing. It makes me so happy to see just how well he is doing. Our biggest struggle has been getting all of his labs perfect. It seems like we get one under control and something else goes crazy. Initially it was his potassium and magnesium. Those have both resolved. We have constantly been trying to get his tacro (immunosuppression) in the right spot. We think we’ve figured that out. 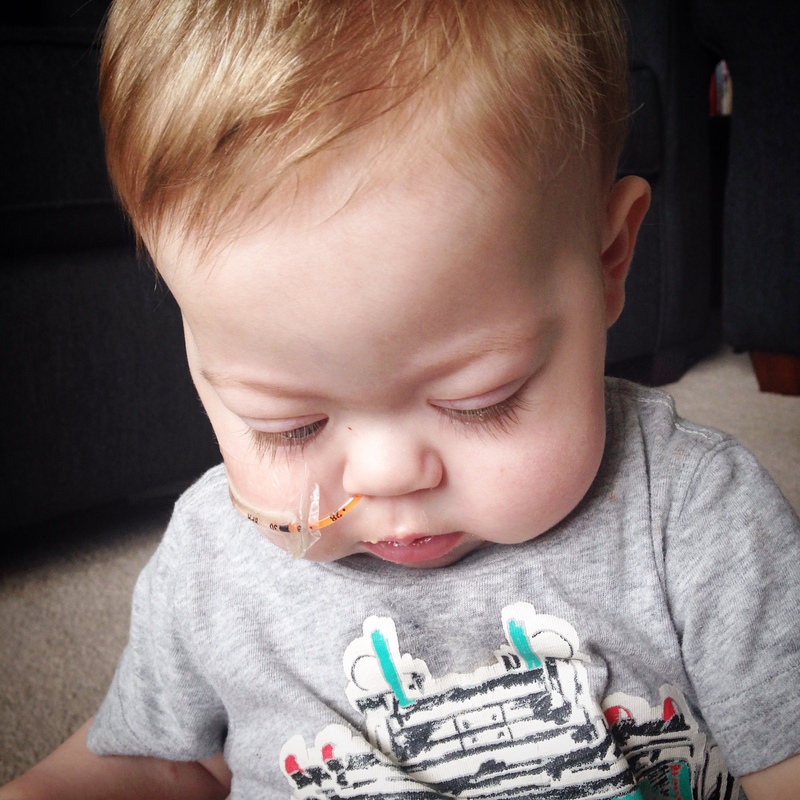 His main struggles now are high blood pressure, his CO2 level and anemia. He is on a lot of iron and it smells and tastes horrendous. His medication for his CO2 is basically baking soda. We mix it all in his chocolate milk and thankfully he takes it although just looking and smelling it, is enough to make me gag. Hopefully as we get closer to his one year mark, we can come off of more of these medications. 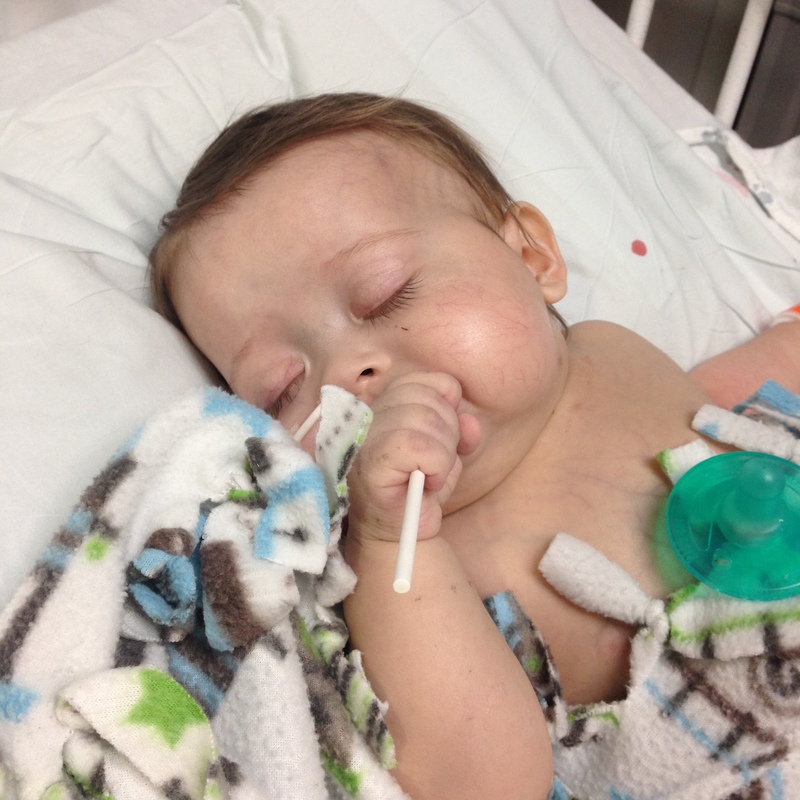 Right after transplant, we had feeding therapy to help him eat and get that stinking tube out. He did so well!! He also was doing so great on his own with sitting up, crawling, etc that I declined physical therapy. He didn’t need it! Now that he’s 19 months old we are noticing that he is behind with his speaking. He can communicate great with us and understands everything we are saying but he won’t babble, mimic or talk much. His main words are mama, no, yuck and uh oh. He has said other words but he says them for a day or two and then won’t say them anymore. He used to say dada, cheese, please, ada (addie) and nigh nigh. He just won’t say them anymore. So we made the choice to have speech therapy come in to help him stay on track. We are excited to see the progress he makes over the next few months. I’m hoping he does as well with speech as he did with his feeding therapy. Even with all of these things going on, life has been pretty perfect. We are finding joy in simple things and really just loving being together as a family. We had a few scares earlier this year with a virus that wiped us all out for a month. It was bad for us all, not just Beckett, although he was the only one hospitalized for it. Twice. That has resolved and we know that it is just our life now. We know that when B gets sick, it is a greater chance that we will end up in the hospital. As I mentioned earlier, our two main challenges have been getting used to the physical changes like I’ve already described and then the emotional challeges. The harder one for Shawn and I is finding our place. When Beckett was diagnosed, we became ‘that family’. We were put on display and were under a microscope, our lives out there for all the world to see. This helped us in many regards because people knew what we were going through and jumped in to help. But it also is a lonely and stressful place to be. We became Beckett’s parents. 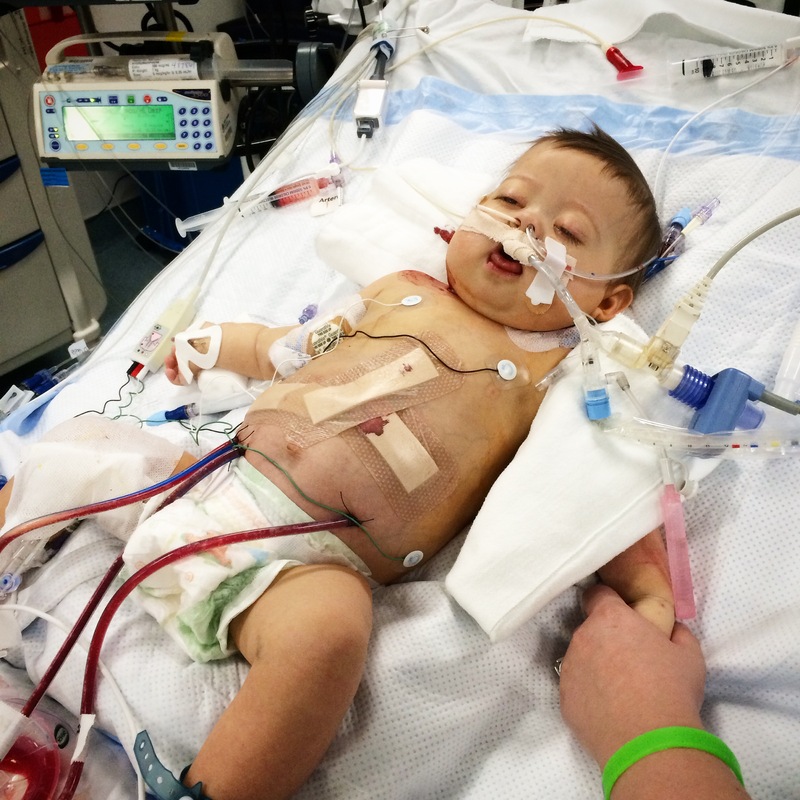 The mom and dad of a little boy needing a liver transplant. It defined us. It molded us and changed us. Now that B is doing so great, we aren’t on display as much. A lot of people in our neighborhood have moved and so less people know to what extent we were dealing with everything last year. And when the dust settled after transplant, Shawn and I both felt lost. Who are we? What is our purpose? We were an ordinary family again. I felt very lost. I was completely changed and couldn’t find where I fit with family, friends and neighbors. I felt like I couldn’t relate to people anymore. Conversations would happen and I felt like I couldn’t contribute because bringing up Becks would be a downer on the conversation. It was so odd. I’ve never experienced anything like that before. Relationships are altered, changed. We still don’t feel like we fit perfectly, but we are finding our way, finding our place again. We also don’t quite know what our purpose is yet, but we are focusing on us and I’m sure that will come. We want to make a difference, we want to help, we want to share. And one day, I hope to be able to look back and see that we did just that and that there was a place for us in this crazy thing we call life. It’s late and I don’t know if this will make any sense but I have so much going through my mind and I need to get it out. Another liver baby passed away. I didn’t know him or his family like I do a lot of the others that have lost their fight with liver disease, but as I lay in my bed tonight, my wall came crashing down. My tears started flowing. My heart aches for these families. Too many little ones have gone to heaven lately. I do a pretty good job of distancing myself from it all. I have to. That was almost us. We almost lost Becks. I still have nightmares that we lose him. I know that something could still happen. I treasure each moment with him because deep down I’m terrified that I will lose him. I’ve seen it happen. My heart sinks with each new post of a family who has been diagnosed, or whose fight has come to an end. I’ve even pulled away from some of the groups I’m part of because it’s too hard. How do you navigate through all the mixed emotions? The heartache that you know they are experiencing, the terror that it could be you, the relief that it isn’t, the faith that things will work out, the joy that you see in your own life, the guilt that you have something that others desperately want back. I don’t know how to feel or act. I am trying to find my place in my new life. I am trying to move forward with faith and not fear and yet not become hardened. I’m trying to not bury my emotions. I want to feel. I want to remember what we went through and remember the pain and fear and worry. I want that to help me to help others. I also want to feel the joy and happiness in my life but that means I have to feel the pain. It’s torture. The agony of seeing wonderful friends go through devastating trials; ones that would break me. The fear every time we get Beckett’s labs, worried that something might be wrong this time. It’s hard having this new level of feeling. It’s hard having it be real life and not just something that happens to other people or in stories. I find myself clinging fiercely to those I love, my husband, my children, family and friends. I find myself praying harder than ever for miracles in the Lord’s timing, for peace in His plan and the courage to walk tall each day. I want to find my purpose in all this. Why have things turned out the way that they have? What can I do? How do I make a difference? I don’t know the answer. I’m trying to figure this out daily. So for now I will pray and weep for those around me, I will squeeze my kids a little harder, and I will turn myself over to Him to mold me and strengthen me, to show me the way I should go, to use me. And I will feel. Love, sorrow, joy, fear. I will allow myself to feel it all. And tonight it’s pain. It’s 5 pm. I’m making dinner. Music is playing loudly in the background and I can’t help but dance a little. I hear the girls playing upstairs, their laughter echoing through the house. As I stir our dinner, I feel a little tug on my pants. I glance down and see a perfect little face beaming up at me. Beckett scrunches his nose and smiles at me. I laugh and watch him as he crawls away to his high chair and pulls himself up. He looks back at me and smiles again. “Love you bubba.” I turn back to our dinner. And the tears start to fall. I have moments like this almost daily now. Where the complete normalcy and beauty of the ordinary comes shining through. I love these moments. Moments that remind me just how far we’ve come and what we’ve learned. This week especially has been extremely emotional. On Thursday, it will have been exactly one year since B was diagnosed. One year. I remember so vividly the fear and worry that we were experiencing. And now our lives are so happy and joyful. A year makes such a difference. Things at home are so perfect. Sure we have our ups and downs but overall life is just so wonderful. The changes that have occured over the past couple months are huge. His picc line was pulled out. No more lipids! We went from twice weekly blood draws to once a week. This has been great since we don’t have the picc line and have to poke Becks each week. We have been going to the doctor every 2-3 weeks instead of weekly. His belly has been staying stable and we introduced fats into his diet. He did great with that so we introduced milk. He hated it at first but once we introduced him to chocolate milk, he’s been doing just fine. We’ve gone from 15 meds down to 10 with a couple more looking like they will disappear soon. We’ve discontinued more than 5 but have added a couple in. It’s fine though because we discontinue heavy meds and add in simple ones like a multivitamin. So many people take multivitamins!!! I’m thrilled that some of his meds are simple ones. He has gone from barely drinking 1-2 ounces of water/apple juice to drinking 25 ounces, 20 of that is milk! Because of this we have cut back how much he gets through his feeding tube. He was getting 17 ounces but now only gets 5-7. We are hoping the feeding tube comes out soon. He eats 3 meals a day and has a couple snacks. He likes pretty much everything!! Just over a month ago I was feeling discouraged because he would barely put anything in his mouth. Our speech therapist was pretty stunned the last few times she came and he had made huge leaps. He went from not being able to sit, to sitting, army crawling, real crawling, pulling up to his knees and now pulls to standing. He is even letting go of the furniture with one hand and has rock solid balance. He is catching up so quickly. I am astonished. One year ago, we were about to embark on the scariest journey I have ever been on. I kept thinking why us? Why Beckett? But now all I can think is Why NOT us? Why NOT Beckett? Look at how our lives have changed. Everyday is beautiful. Everyday I see the beauty in the ordinary that I never noticed before, at least not with any regularity. I see it in everything we do. I cry tears of joy almost daily thanking my Father in Heaven for his abundant blessings and his wisdom in teaching us a very valuable lesson. A painful one but one that changed my perspective and has made me a better person, wife, and mother. And so I look forward to future little tugs on my pants, and my heart. Constant reminders of how blessed we are and how wonderful life can be if you’re willing to look for the little, ordinary, perfect moments. Last weekend was such a wonderful one. I never want to forget the events that transpired that led to our son getting his second chance at life. I woke up the morning of Friday the 12th in the best mood I’ve been in for a long time. I just felt so good. Life was wonderful. I was seriously bouncing off the walls. It was our anniversary so I thought that could be the reason why I felt so happy. I said my morning prayers and spoke to my Father about how today would be an amazing day for a new liver since it was our 7th anniversary. The girls woke up and we started on our day together. Periodically throughout the day, Shawn, who was at the hospital with Becks, would text or call. I kept telling him how happy I was and he kept telling me to calm down. I couldn’t. It was pretty funny. Partway through the morning, I felt like I needed to go to the hospital on Saturday and spend the day. Usually I take the weekend at home so that I can be at the hospital during the week to allow Shawn to go to work. I’m never at the hospital on Saturday. But I felt strongly like I wanted to spend the day with my boys. I arranged to have the girls stay with their Aunt and cousins Friday night for a sleepover and then stay and play all day Saturday. Around 6 pm I dropped them off and grabbed a bite to eat. I kept texting Shawn how happy I was and excited about life. Life is beautiful. He seriously thought I was crazy for being so happy when our son was so seriously sick in the hospital. I told him I would be up to the hospital really early in the morning. After I ate I didn’t know what to do and I was still so excited and hyper. Shawn suggested that I do some service for others. And immediately the thought came to mind to make cookies and write some notes to a couple neighbors and friends who have made a difference in my life lately. I dropped them all off and everywhere I went they would ask how we were doing. I just kept saying, “I’m amazing! I feel so good about life. I’m so happy!” I probably looked a little crazy. I spent time talking with a friend and then went home to bed. I went to bed at midnight, looked at the clock, sighed with a little smile on my face and then said my evening prayers. I said to my Father that even though we didn’t get a new liver, the day had been amazing and I was so grateful for the peace and joy that I had felt. I told Him that I wanted to keep that feeling as we continued to wait. Saturday morning rolls around and I was up pretty early. I felt so sick to my stomach. I was nervous and anxious to get to the hospital. Shawn sent me a picture of him and Becks saying they were excited to see me. I got my belongings together and headed up. I walked into the ICU and over to Beckett’s room. Shawn was standing at Becks bed and looked at me. “It’s going to be a great day, ” he said with a grin and tears in his eyes. I immediately started crying. “Are you kidding me? Are you serious?” He grabbed me and pulled me into a huge hug. “I guess that’s why I felt so happy yesterday,” I said. *Side note. How we got “the call” is actually pretty humorous. Because it’s so us. They called the hospital room where Shawn was staying with Beckett. The call came in at 3 am. Now those who know Shawn know that he can sleep through anything. It’s one reason why he does better here than I do. He can sleep through the beeping and the nurses coming in and out. Ask any of our nurses; they’ll tell you just how deep he sleeps. So the phone rings at 3 am. Shawn sleeps through it all. The resident got our call but didn’t wake him up. Morning comes and our nurse told Shawn that the resident wants to talk to him. Now we had been pretty worried about some labs the day before so it made Shawn nervous that she wanted to speak to him first thing in the morning. Shawn starts getting ready, completely oblivious to what was actually happening. He walks out of the room to go to the bathroom and a doctor was sitting right outside our room. He says to Shawn. “It’s going to be a good day.” Shawn was thinking, “Uh, ok.” After he got back from the bathroom, the resident walked in and informed him that we had the offer. The rest of the day is a blur. We had so many doctors and nurses in and out of his room. They ran a full panel on him checking his urine, stool, and blood. They drew so much blood from him to check just about everything you can imagine. He had a chest x-ray, and numerous consults from cardiology, nephrology (kidney), hepatology (liver), anesthesiology, and of course the surgeons. We also had someone come by to ask for our consent to take a piece of the old liver to study it. Of course, we said yes! We hope that something good comes from that bad liver. It was such a busy day and yet went by so slowly. When we spoke with the surgeon he told us that his colleague was flying out to check the liver. He said that they could cancel the transplant at any time especially once they see the liver in person. But they all felt very good about it. We also found out the liver was O+ and was the perfect size for Beckett. What a miracle!! All the scary talks of cleaning his blood to be able to accept a different blood type now didn’t matter because we wouldn’t have to do that with a perfect match blood type. Around 3 pm we were told that they were on the way back and they had the liver with them. At that point we started telling our families. The OR time was originally set for 5:00 but got bumped back until 5:45. We didn’t end up taking him in until just after 6. The hardest moment is kissing him good bye and watching the doctors and anesthesiologist wheel him away to the OR. That’s when I lose it every time. I trust them. I know they will take good care of him. But so much could potentially go wrong. It’s terrifying. Shawn and I cried and then walked outside to be alone and process. We sat outside the hospital. I texted a friend to come up and keep us company while we anxiously awaited for updates. Through the past 8 months of near constant hospital stays, we have made a lot of friends at the hospital. Nurses, residents, attendings, ultrasound techs, interventional radiologists and other staff. As we waited outside of the hospital we saw so many people that we knew. And it was SO good to hear them ask about Beckett and be able to tell them that he was in surgery right now receiving his new liver. Once it got dark we headed inside to wait. We ordered pizza and settled in for the long haul. Thankfully our friends helped keep things light so that we could talk and laugh and it didn’t seem too stressful. After about an hour of waiting we received our first update. Beckett was prepped, sedated and they were about to start the actual surgery. The next call came two hours later. Still working on getting the old liver out, the new liver was cleaned and ready to go. Another two hours. Old liver out, new liver is being worked on. After that we got our last update. New liver is in, blood circulating, making sure there were no leaks and that everything is taken care of. And then the call that he would be going to the PICU (pediatric intensive care unit). Our surgeon called a little while after that to tell us that he did great and was stable through the whole thing. Everything looked good and we could go see him in just a little while. By this time it was just after 1 am. Our friends left. We walked up to the PICU waiting room and FINALLY at 2:45 am they said we could come see him. I was nervous. We knew what to expect but I was a little afraid to see him. We walked to his room and there were so many people settling him in, preparing all his pumps of meds and fluids, cleaning him up etc. We were hesitant but walked over to him. We were shocked. In the 8 hours since we had seen him, he was already pink. I didn’t see anything else in that first moment. Just his skin that was already changing. After that wore off, I started to take in a mental image of what I was seeing. He was limp and still very sedated. He had a breathing tube, 3 drains coming directly from his abdomen, bandages over his huge incision, a bloody bandage on the right side of his neck and an IJ line (inserted into his jugular vein) on the left side of his neck. He was a mess. But he was so beautiful!! We stayed with him and got him situated and cleaned up. I stroked his head and arms. I was in awe of this perfect little creature. Around 3:30 I decided to get some sleep. Shawn stayed with him and slept by his side. I wish I could describe the feelings that we felt that night. I think I experienced every emotion you can imagine. Fear, worry, joy and utter relief. Oh the relief. It was as if a gigantic weight had been lifted from off our shoulders. Our little man would be ok. We are blessed.